Do I need to grow Chrysanthemums? At the other end of the season from Tulips, Carol Siddorn of Carol’s Garden has written about these end of the season beauties. There has been much talk about Chrysanths, and with a great Flowers From The Farm group buy coming up, I started to think about which and when to grow them. I grow quite a few, and have done for many years, but the quantity, colours, & style has changed over the years. I started growing them for myself, then for Christmas, then for autumn bouquets and now for weddings and wholesale event florists. So, should you grow them? Chrysanths are daylight dependant flowers. This means that they will flower according to the number of hours darkness or daylight they receive. Literally, like clockwork. The response to darkness varies with variety, so they are grouped according to their flowering period. Early varieties will generally flower from early Sept to mid Oct in the UK, intermediates from mid oct to end November, and Late varieties from mid Nov to end December. These timings are what I have found here, in NW UK, but may differ for you, even within the UK. You can’t alter this flowering period by heat or feed, only by manipulating the hours of light (or more accurately, the hours of dark) they receive. 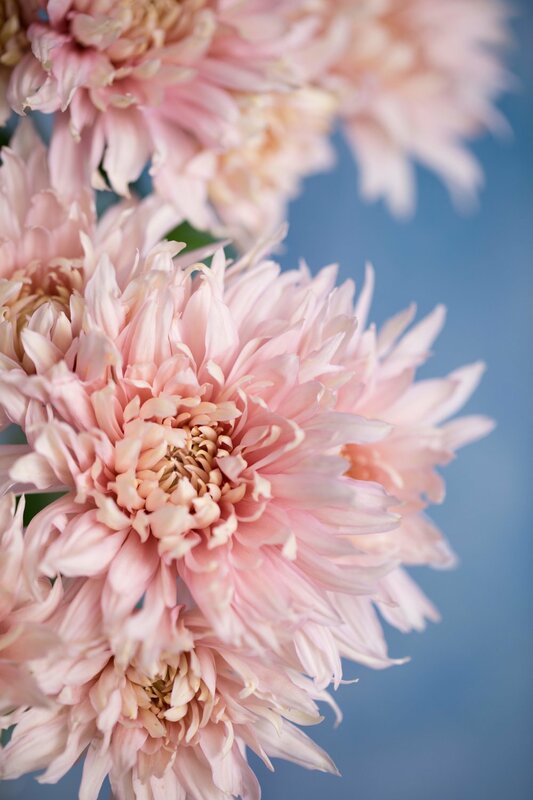 This is how All Year Round chrysanthemums can be grown anywhere in the world - by maintaining appropriate growing conditions and then shading or lighting the crop to flower at exactly the time they are needed. For the later flowerers, you need to consider the weather in the UK, and whether you are able to protect the flowers from rain, wind and frost. The plants themselves are quite hardy and may survive frosts (but not wet), but the flowers will be damaged by frost. Any flowers outdoors in wind and rain will get wet and are then almost impossible to keep upright. Even indoors, they need good staking. We had a hard frost mid October this year and the flowers already blooming in the tunnel were spoiled, but the tight buds lower down were ok, and are now flowering in the milder conditions we’re having in November. So, if you can only grow outdoors, you can only reliably grow the early varieties. And these will, most likely, overlap the flowering period of dahlias. So maybe go for different shapes and colours than the dahlias you grow, to ring the changes into autumn. There are some beautiful, soft shapes and muted colours, that dahlias just don't do. I especially love the Allouise series, although the heads on these can get quite big. If you have unheated, covered space eg polytunnel or cold glass house, you can try the intermediates too - so long as you have a market for them in mid oct to end Nov. This opens up a much wider choice of colours and shapes…..limiting your selection becomes the problem here! You can only realistically grow the late varieties if you can offer frost free protection to mid/end December. I’ve never been able to do this in NW UK in an unheated greenhouse. They might flower, but the quality is poor, and disease is a major risk. Older PostDo you need Tulips?